The legendary chain of clubs comes to Europe. This is the first branch of the Blue Note jazz clubs to open in Europe (besides the clubs in New York and Japan). It hosts Italian artists and big international names. Past acts include McCoy Tyner Trio, Billy Cobham, Richard Galliano, Dee Dee Bridgewater, Stanley Jordan and many more. Blue Note Milano offers live music five or six days a week (closed on Mon) with an Italian menu (starters and primi piatti from 16 €, secondi and grilled dishes from 23 €). Following Blue Note tradition, there are two shows every night at 9 pm and 11/11.30 pm. However, they charge you separately for each set, which is unusual for other clubs. So, this is definitely not your cheapest option, but they are the Blue Note and your very likely to get value for your money. There are three types of ticket fares: advance (discounted fare, from the opening of the ticket sales until 7 pm on the date of the show), door (full price fare, available at the Blue Note Box Office) and cut price fare (promotional ticket with discount from 20% to 40%, available at at the Blue Note Milano Box Office). 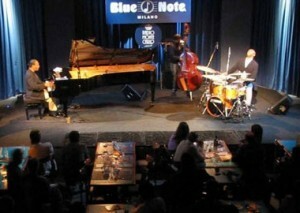 Blue Note Milano offers discounts (40 %) for young people aged under 26 (available for the 11.30 pm shows) and for people over 65 years (available for 9 pm and 11.30 shows). These discounted tickets are available only at the Blue Note Milano Box Office. INFO: Info on how to buy tickets http://www.bluenotemilano.com/eng/Howtobuy/tabid/118/Default.aspx You can buy tickets at the Box Office (37, Via Borsieri, opening hours: Tue to Sat 2.00-10 pm; Sun 7.00-11.00 pm), on line paying by credit card upon registration or by phone by calling the Customer Service (+39 02-69016888) and paying by credit card. You will get a confirmation code via e-mail that will allow you to collect tickets at the Blue Note box office on the night of the show.